The United State Department of Agriculture (USDA), on August 30, forecasted U.S. net farm income for 2018 to decline 13% from last year, from $75.5 billion in 2017 to $65.7 billion in 2018 (USDA 2018). If realized, U.S. net farm income would decrease to levels witnessed in 2016 (Figure 1). This decline is even larger when we consider inflation-adjusted values, showing a 14.8% decrease in real U.S. net farm income. The USDA also made a similar downward forecast for U.S. net cash income. Net cash income is projected to drop 12% in 2018, from $104 billion in 2017 to $91.5 billion in 2018. These declines in farm income reverse the small rebound in income in 2017 to what would be the second lowest values in inflation-adjusted terms since 2002. The latest USDA forecast did not consider or include payments made under the Market Facilitation Program (MFP) to producers in response to decreased prices, as a result of ongoing trade negotiations with several U.S. trading partners. A question which may arise is how MFP could change the forecast for U.S. net farm income. The MFP program is expected to make direct payments to farmers close to $4.7 billion with purchases of excess commodities of $1.2 billion and $200 million reserved for identifying new international markets through the Foreign Agricultural Service for an initial total of $6 billion on agricultural commodities (USDA, Sept. 2018). 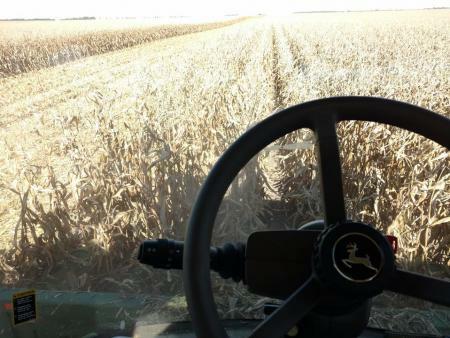 If trade negotiations continue to weigh on commodity prices, another payment of $4.7 billion could be released to U.S. producers later this fall. Considering that in the 2018 forecast, net government payments represented 7.8% of net farm income and that net government payments (i.e. government payments subtracted from federal taxes paid by producers) were negative (- $5.2 billion), an increase in government benefits could mean a smaller decline in net farm income than expected. Nevertheless the downturn in the farming sector, witnessed since 2013, would still be present. Source: USDA – ERS. Farm Income and Wealth Statistics. Graph elaborated by the authors. The USDA also released the estimates for Ohio net farm income for 2017. 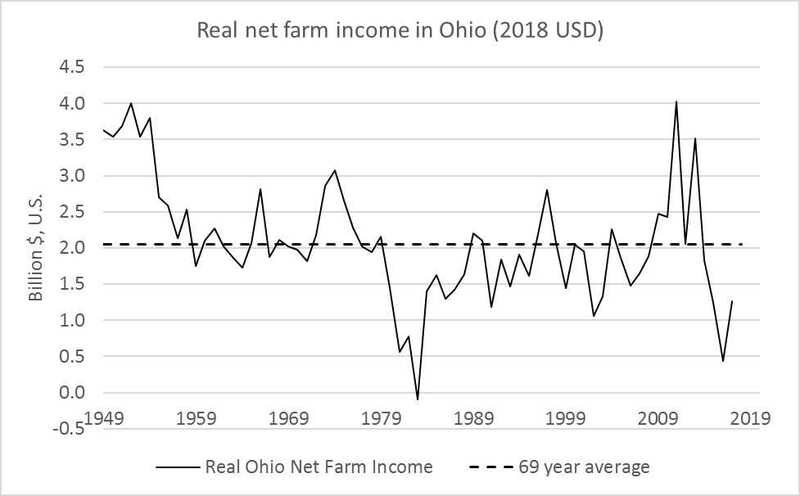 Similar to the U.S. estimates from 2017, Ohio net farm income showed an increase after large declines since 2013 (Figure 1). In fact, net farm income in Ohio in 2017 was about 3 times larger than that of 2016 (from $0.4 billion to $1.3 billion). The concern, though, is that the 2018 Ohio farm income would experience a downturn similar to the forecast for the 2018 U.S. net farm income. 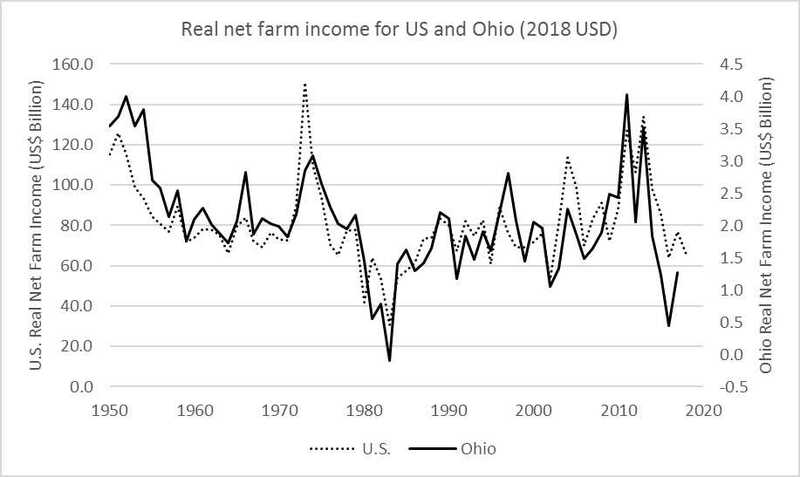 Figure 1 illustrates how Ohio and U.S. net farm income have trended in the past. They seem to follow similar trends which may mean that Ohio net farm income would probably see a decrease in 2018 with respect to 2017.